And a quarter of the year is gone just-like-that. We had a weekend away at the beach. That was lovely. There were birds, and there was gentle sunshine, and sand and shells, and friends and a son and his guest, and lovely food and wine. Best of all, swimming in the sea washed away my head cold, and now I can breathe through both nostrils, and sleep without dreaming of being suffocated by collapsing buildings or lead blankets. Four more weeks of full-time day-job to go, beyond which there's a forest of short-story deadlines and a NSW Writer's Fellowship for which I've promised to kick the next novel into action. And then comes July, which is Printz-trip month, during which I'll roam the northeast corner of the US. And then it's...probably back to a different day-job, if there are any left by then. With a Plan in train, by then, I hope, to keep moving on the novel. Keith Stevenson is editing a collection of six novellas, which he's publishing through Coeur de Lion. My seal-wife story, 'Sea-Hearts' is in there, and there are also novellas by Cat Sparks, Terry Dowling, Louise Katz, Paul Haines and Trent Jamieson. 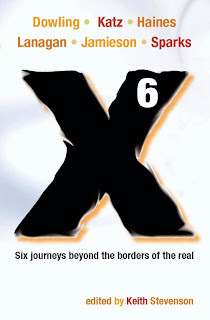 The collection is called X6, and the cover looks like this. It should be out mid-year. Keep an eye out for it. Are we more, or less, open-minded than we were? Come and watch us melding our minds over at SF Signal. Various knickers get knotted, and knockers knitted, over censorship and taboos. The comments are looking healthy already. Also, went to the State Library and photocopied a chunk of history book for the purposes of research. Reading-wise, I'm through If This is a Man and into The Truce by Primo Levi, but all leisure reading and other fun will have to be pushed aside as I check the UK proofs of Tender Morsels. Plus read a book for blurbing. Like a bad joke, the rent for the Writing Room has gone up $10 a week. has been happening except work and sleep. My train reading is 1788 by Watkin Tench, edited by Tim Flannery, and my night-time reading is Primo Levi's If This Is a Man, a translation for Everyman's Library that is littered with errors and oddities. The story is powerful enough to make it through all that. No writing is being done beyond a few miserable scraps in notebooks. Perry has been Watching me again—hi Perry!—as well as mentioning me to Moleskinerie for my notebookerie. ...unless you were there at Kinokuniya last night, in which case, thank you for coming! Didn't we do well? We were hardly rude to each other at all—we saved that for the restaurant afterwards, where insults flew and hair was torn and other patrons were scandalised. Nah, it was fun. Justine had lots of good stories up her sleeve, and she needed hardly any kicking at all to get them flowing. There was standing room only, and people were standing in it. There were two big book-stands with only Justine's and my books on them. And I signed a whole bunch of stock, which means that they must have sold all those other Tender Morsels I signed for them back in October. And lots of wonderful people came up and talked to us afterwards. And now it's Friday, wOOt! A happy day to all. Come to Kinokuniya. Come to Kinokuniya Hill. Tomorrow (Thursday 5 March). From 6pm. Justine and I - or, as Justine would say, me and Justine (except she'd say 'me and Margo', of course). We'll be 'in conversation', which is a totally non-threatening way to say I'll be PINNING HER TO THE WALL asking her all the questions I've been wondering about since I first met her-and-Scott. For half an hour Justine Larbalestier will be AT MY MERCY. And the public is welcome to watch. It will cost you nothing but a little time.